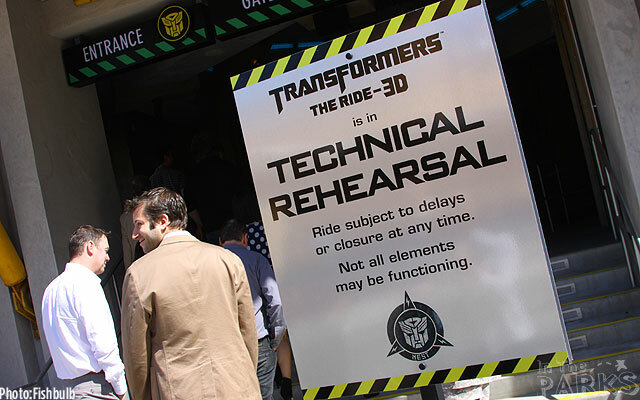 We first posted this review when we heard that Universal's new Transformers: The Ride 3D might open for "Technical Rehearsals" as early as April 19th. 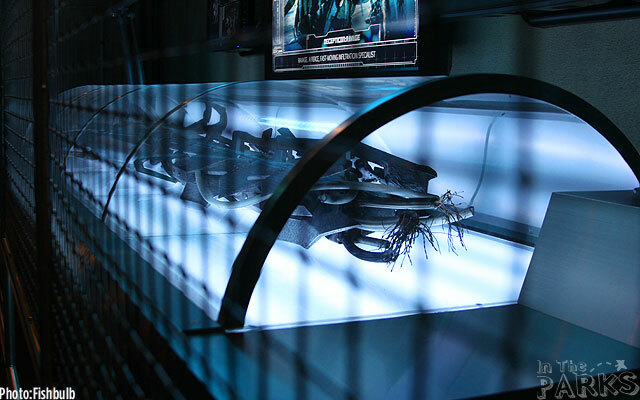 On the 18th, we were contacted by Universal representatives and invited to come down the next morning and see for ourselves. Sure enough, the ride opened with the park at 10am and we rode repeatedly for a couple of hours (as the ride had a very short line). We were also invited to N.E.S.T. headquarters to walk the track of this new mega-attraction prior to its opening to the public. 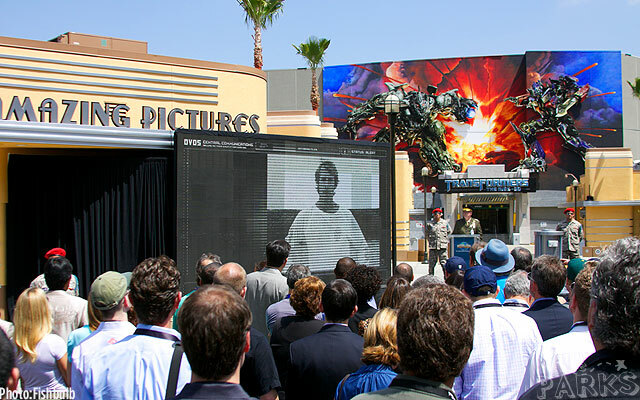 We have visited the attraction multiple times (before and after its opening to the public) and even attended the official grand opening press event on May 24th, 2012. Below, you'll find photos from a variety of our visits. 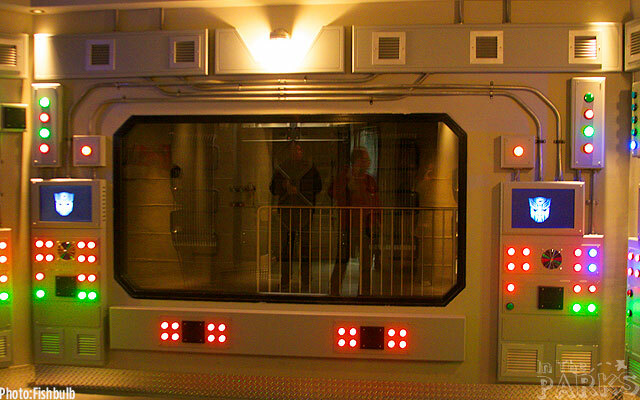 So what did we think of this attraction? Well, quite frankly, we were blown away by it. 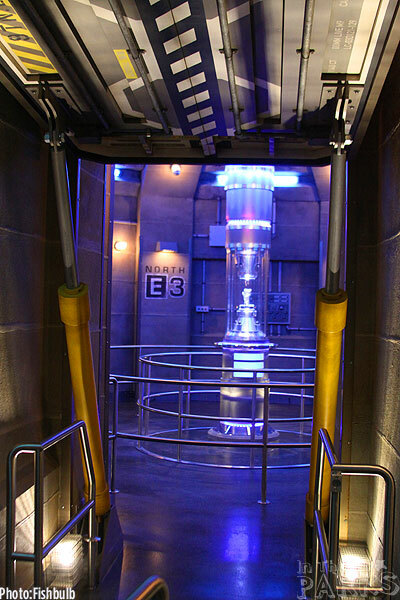 The 3D is on par or better than what you see on Star Tours, but on this attraction, the simulator seats 12 and moves on a track with a full range of motion (up, down, dodge, shake, spin), with crisp audio, and an action packed story line which will have you exhausted at the end. Yes, it's as amazing as it sounds. 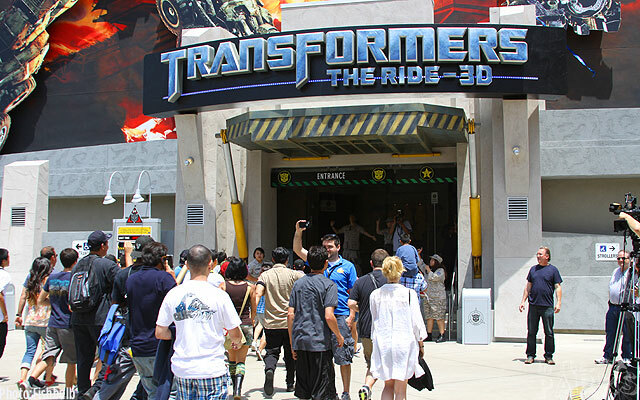 What is Transformers: The Ride 3D? 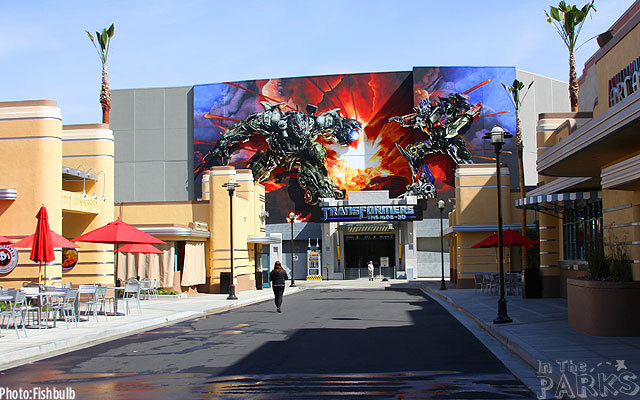 The boxy (sound stage like) show building is masked only by a larger than life mural of transformers in battle. 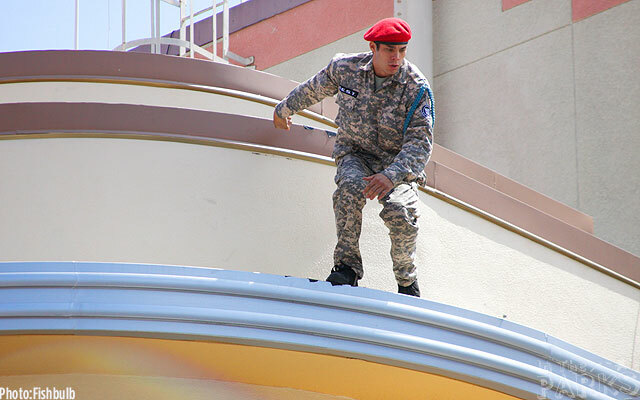 You can't miss it as you descend the Starway from the upper lot. 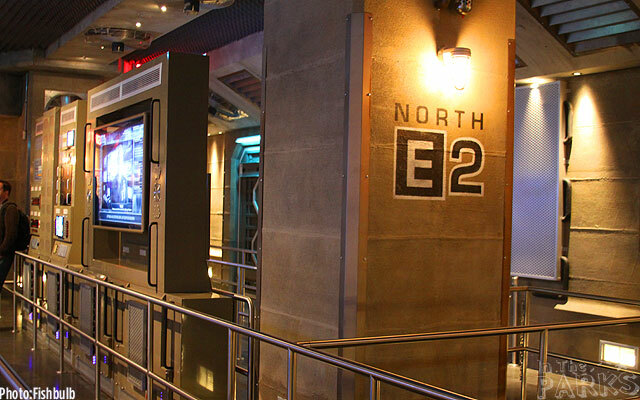 Upon entering the attraction show building, you'll find yourself in N.E.S.T. 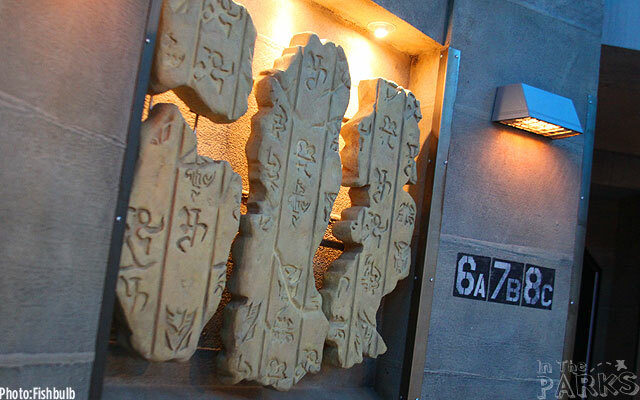 headquarters (Nonbiological Extraterrestrial Species Treaty). 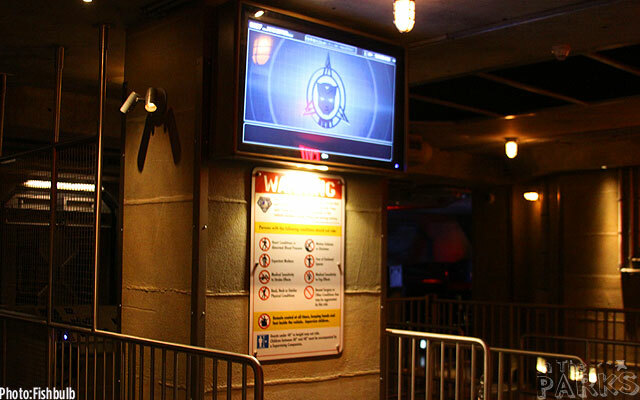 Here, we are divided up into three groupings; Regular queue, Gate-A (front of the line), and Single Rider. Form there, the lines separate and begin to set up the storyline for the adventure ahead. 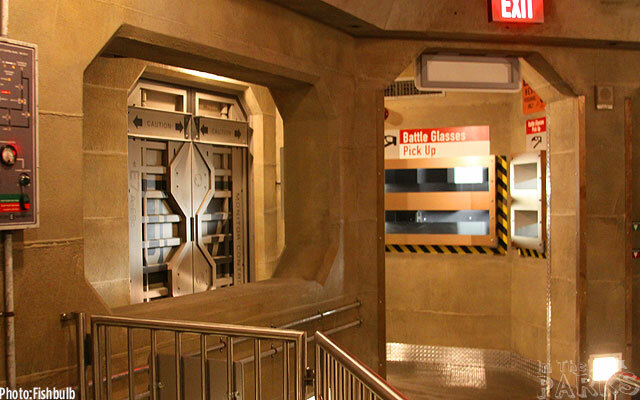 Not only is the queue well themed, it is also quite large and completely temperature controlled (which will be a blessing this summer). 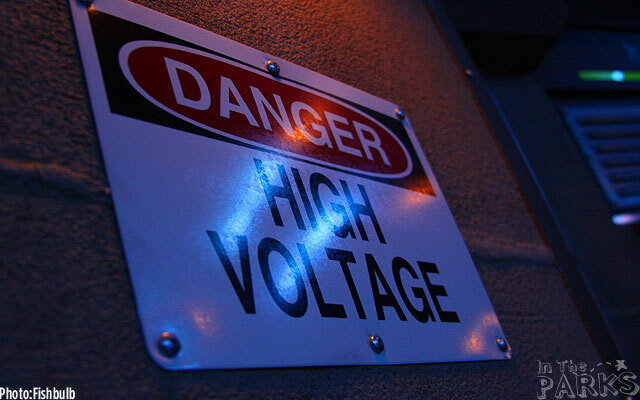 While in the queue, you'll learn that it is a time of extreme danger. 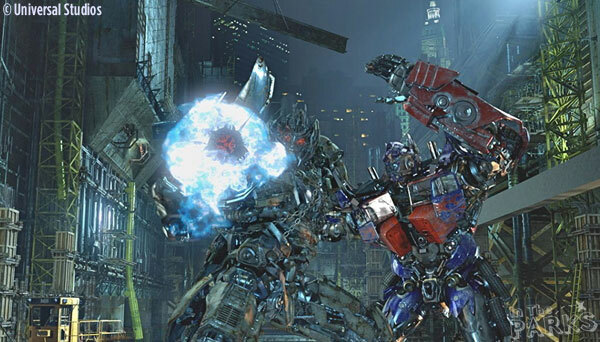 The Decepticons are on the attack in pursuit of the "All Spark" that would give them ultimate power. 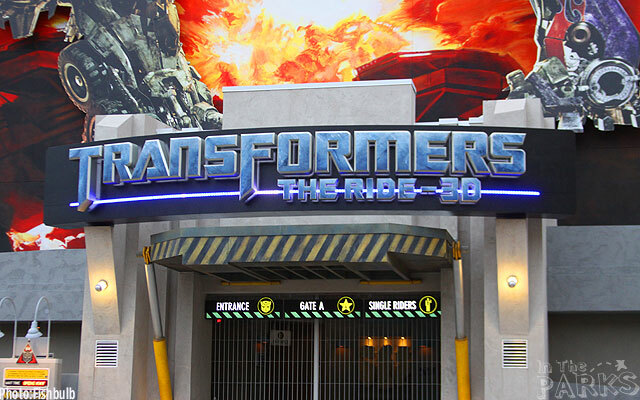 As you might expect from a theme park attraction, you are recruited to help fight the Decepticons and soon find yourself aboard your very own Transformer vehicle to join the fight. 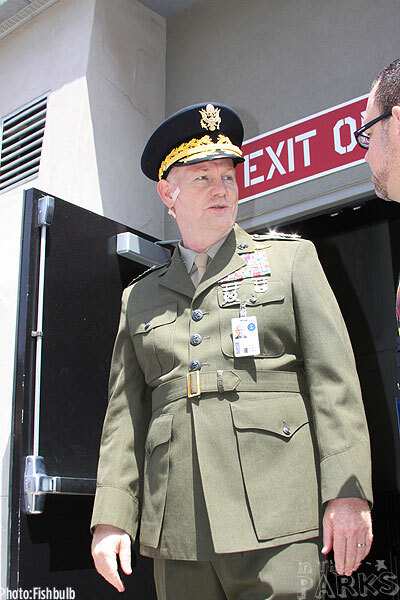 Click for larger, downloadable image. Grabbing a pair of 3D glasses we hop on board and are off for 4 minutes of high-tech wizardry and fun. If there are smaller ones in your party that cannot or choose not to ride, there is a waiting area just to the left of the loading platform. The waiting area window looks out onto the returning vehicles. 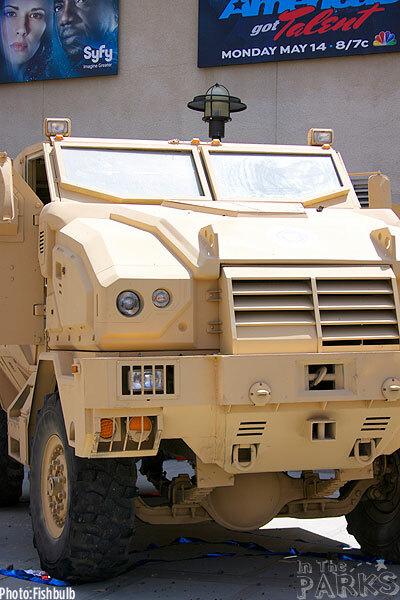 Each vehicle is a roaming flight simulator that darts, spins and careens through practical sets that are perfectly blended with High Definition 3D projections to create an impressive illusion of reality. 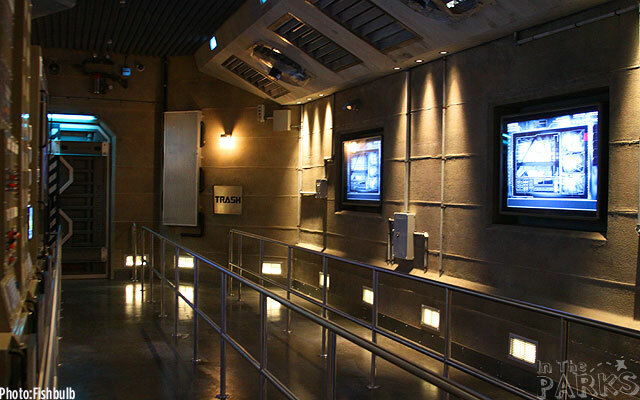 The attraction fuses rear-projection HD3D screens, practical sets, heat, water and smoke, and flight simulator technology. 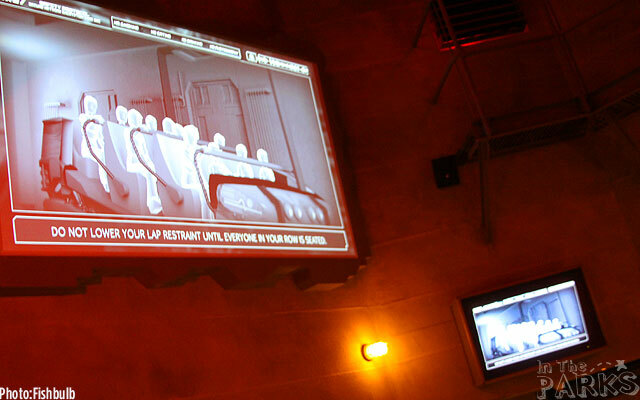 All of the photos you see below from the actual ride portion of the attraction were taken while on a guided walking tour we took on April 13th. You are not actually permitted to take photos while on the ride, so we were quite fortunate (and thankful) to have been invited to take these photos before the attraction opened to the public. Some of these shots are with work lights on, and others in show mode. 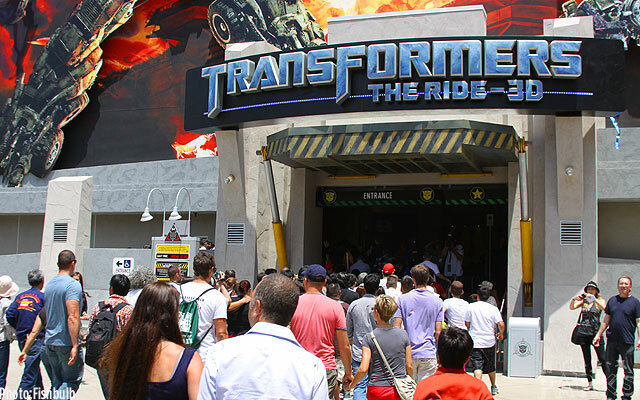 With Spiderman and Harry Potter in Florida, and now Transformers in Los Angeles, Universal has amassed an impressive collection of dark-rides that rival the best of Disney. 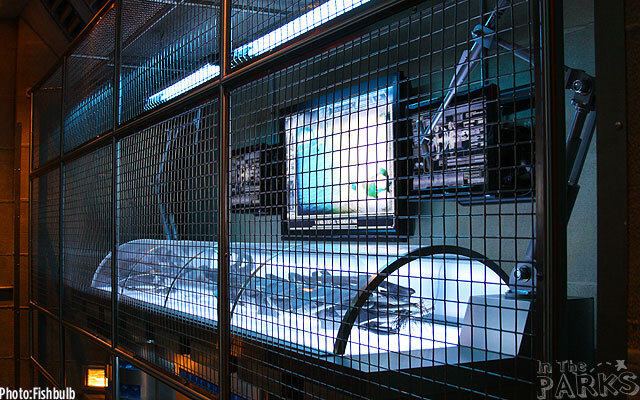 We were blown away by the technology of this new attraction. 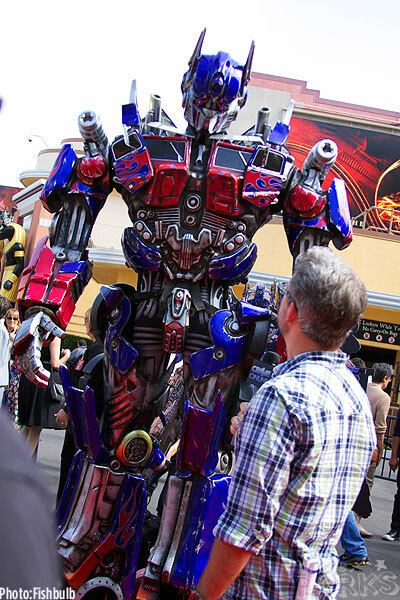 As of the writing of this article (prior to the opening of Radiator Springs Racers at Disney) we feel that Transformers is poised to battle Disney for best new attraction in the Southern California market and one of the top attractions overall in Southern California, if not the world. As of Mary 24th, 2012, this ride was officially opened to the public. 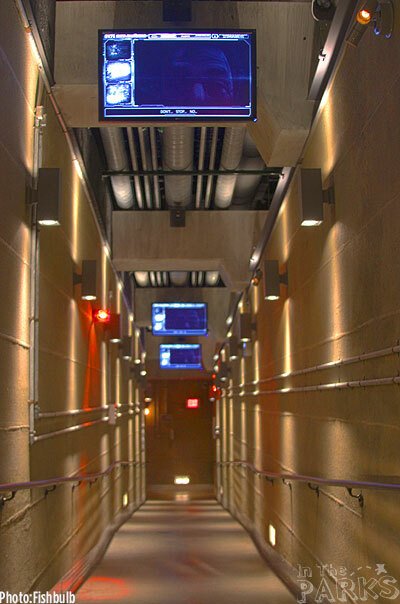 Buy an annual pass, because you are going to want to visit this attraction several times this summer. Universal seems to have a solid hit on their hands and may have built a ride that at one time would only have been possible by Disney. Kudos to Universal Creative, we can't wait to see what they have cooked up for their next big project, Harry Potter. 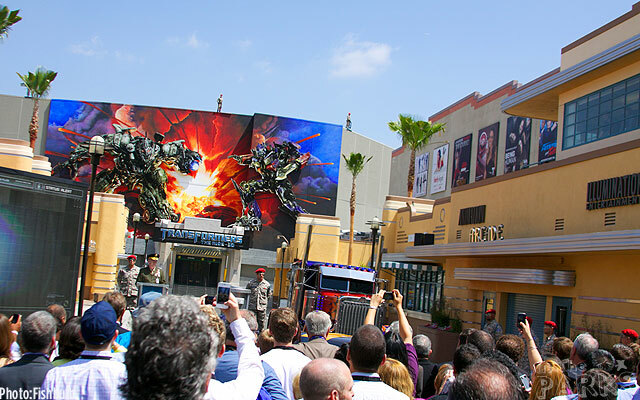 After 4 weeks of "Technical rehearsal", or soft opening for you Disney folk, Transformers: The Ride 3D officially opened with fanfare, a little pyro, and a few celebrities thrown into the mix on Thursday May 24th, 2012. 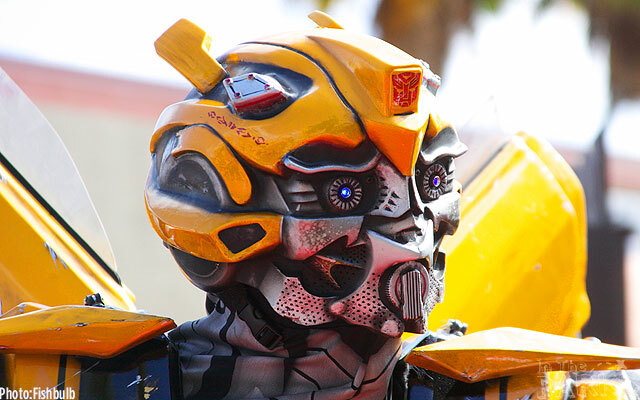 The Bumblebee walk around character was a big hit. Imagine having to walk around in one of these costumes in the heat of summer. 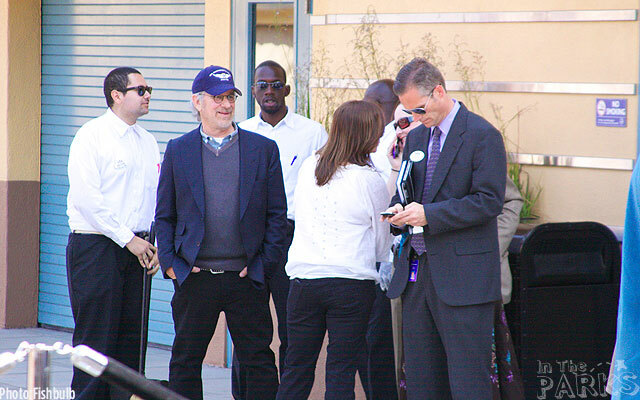 The king of cinema, Steven Spielberg, was hanging out at the grand opening ceremony. 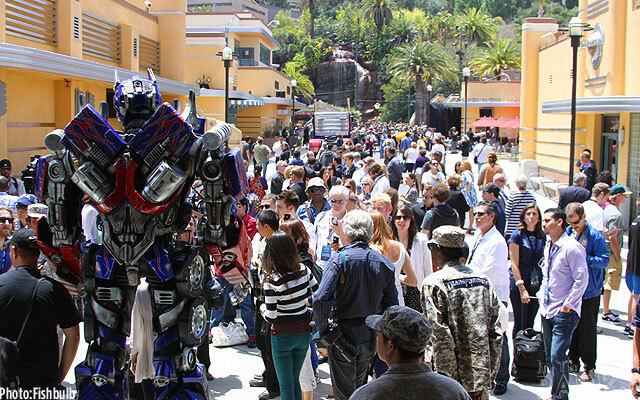 Optimus Prime chatting up the crowd. 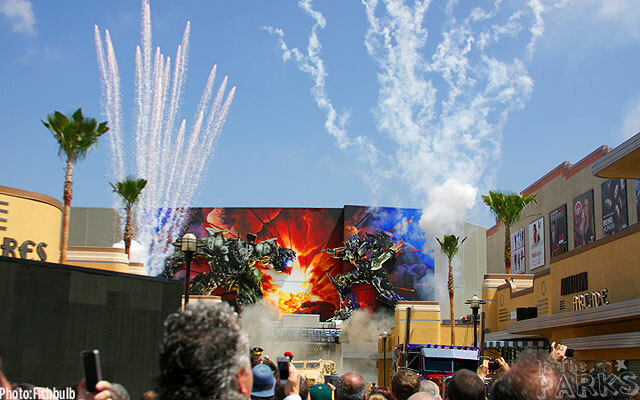 After a taped message from Michael Bay, Director of the Transformers movies, and the arrival of General Moreshower, a staged battle took place that culminated in the opening of the ride. General Morshower began the ceremony. 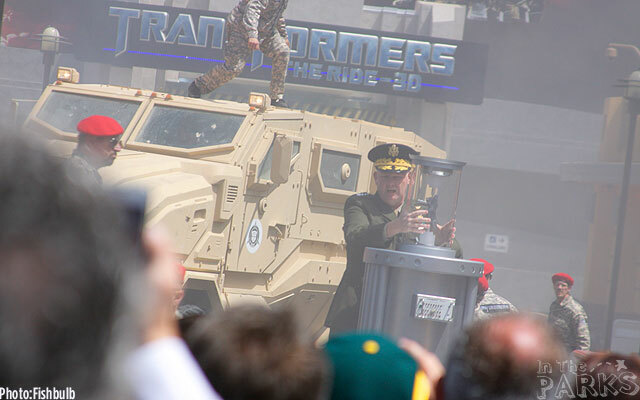 "I'm Michael Bay and this @#%! just got real. Thank you." 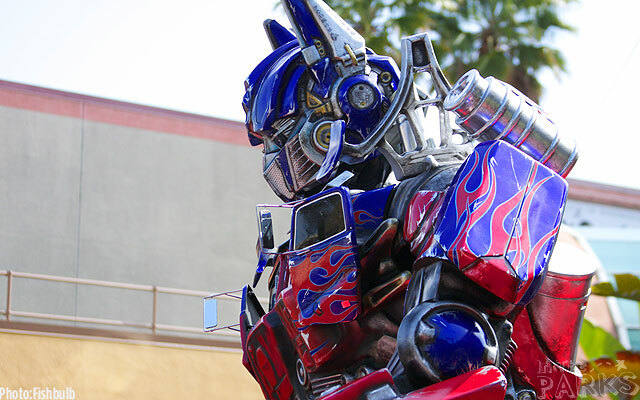 You can almost see Optimus Prime. 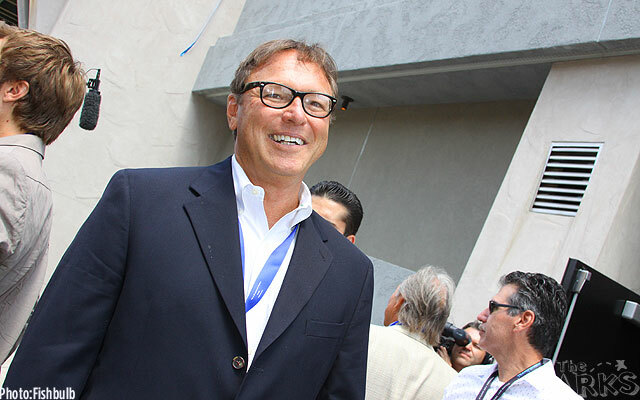 Larry Kurzweil, President, Universal Hollywood. 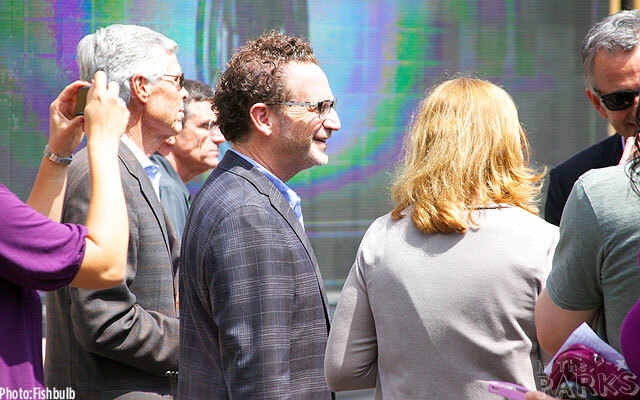 While there were many interesting people in attendance, not the least of which was executive producer Steven Speilberg, none of them took the stage during the ceremony. The star of this show was the ride itself. All of the creative and executive teams got first dibs on the ride. 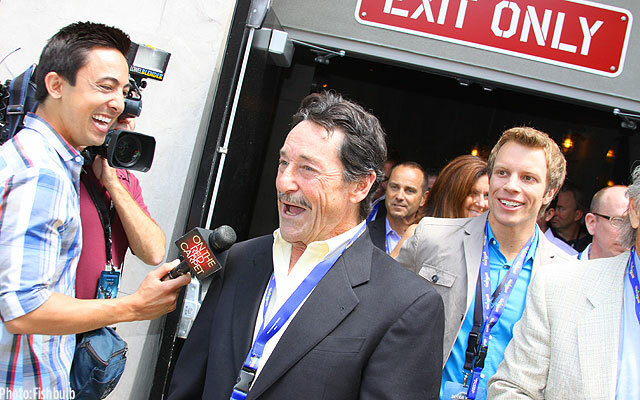 The VIP's, celebrities, and then the throngs of press from around the globe were given the green light to head in. 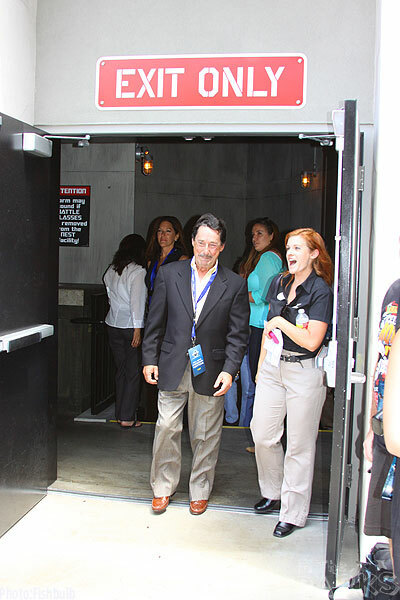 Chick Russell, Show Producer, Universal Creative, Universal Parks and Resorts. 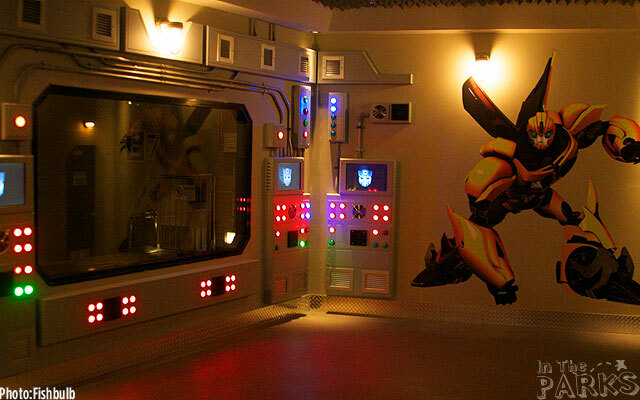 We asked one of the first little boys out of the attraction what he thought, his answer: "Freakin' AWESOME!". It's going to be a very good summer for Universal. 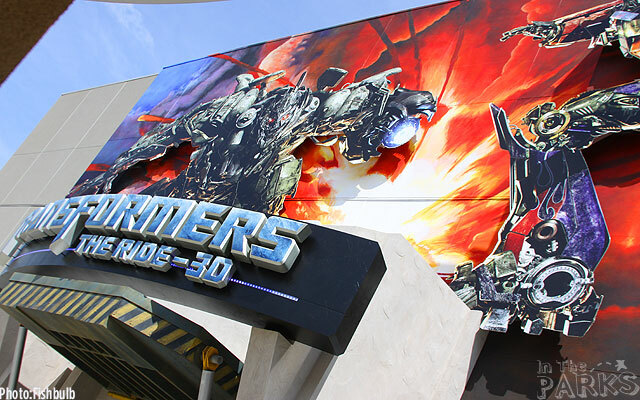 Have you visited Universal Studios Hollywood's Transformers The Ride 3D? Let us know what you think and don't forget to vote in the poll. AUTOBOTS, ROLL OUT!! AMAZING! MUST RIDE! Neat! Although part of me is bummed that (one of) the Munster's soundstages is really no more..
Looks amazing, can't wait to get on this thing. And if it's even 1/2 as good as Spiderman then it's still going to be an amazing ride. Riding next week! Can't Wait! As a pioneering Disney nerd and Disneyland fanatic, it has taken me a LONG time to warm up to Universal. With Spiderman, I started to open my eyes. By the time the Wizarding World of Harry Potter opened in Florida I was a fan. 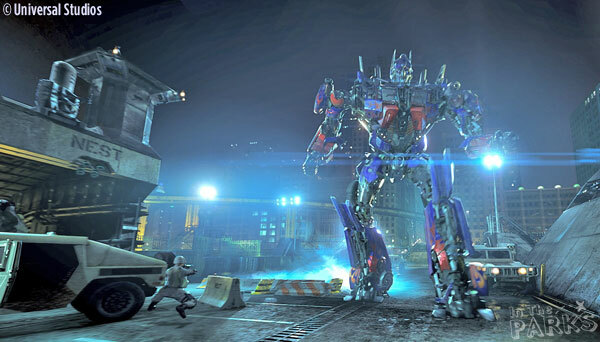 And with what we've seen of Transformers I can only say WOW! 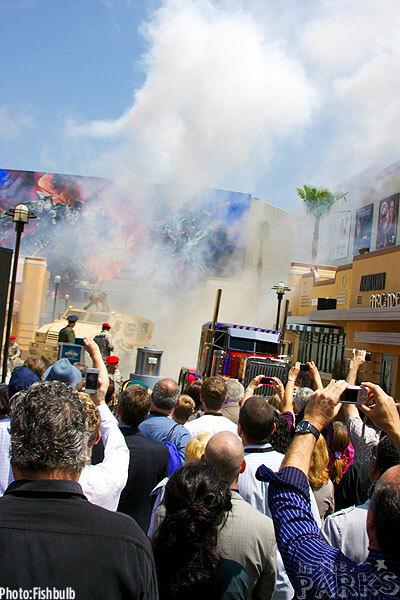 Universal is trying harder than perhaps any other theme park brand to win customer hearts and attention. I'm still crazy in love with Disney and feel that the competition (or even war) between Disney and Universal will be GREAT for theme park fans in general. 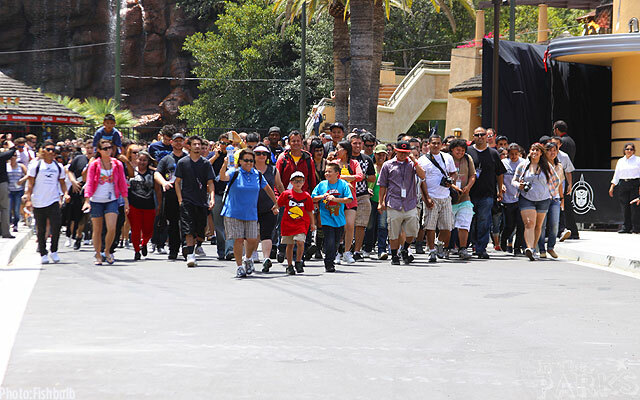 The best thing that could happen to Disney is for Universal to have a record summer. 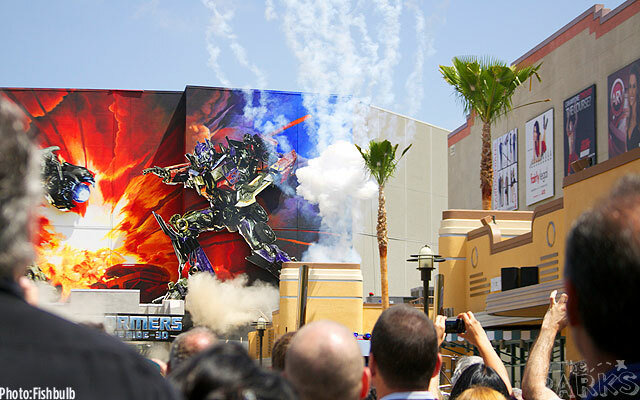 Imagine the budgets that Imagineering might be given if Transformers does really well. This is the most exciting time for SoCal theme park fans since the early days of Disneyland and Knott's Berry Farm when they went back and forth trying to one up each other. Disneyland has been without a major competitor for so long, that I don't think they really felt the need to compete. By the time Uni Hollywood opens their Harry Potter attraction, I expect that all that will have changed. Uni wants a piece of the pie! 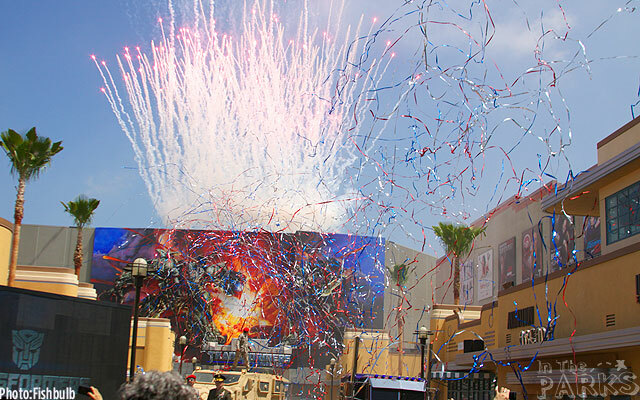 CONGRATULATIONS & THANK YOU, Universal! I'm glad we purchased the 5 visits (now for $59) pass at Costco! 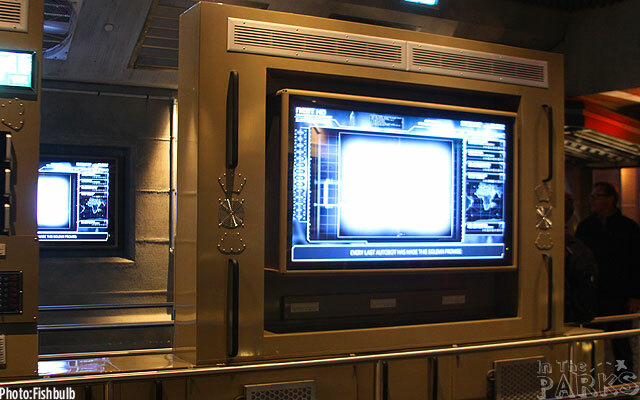 P.S., Hey Universal, please check out Mickey Mouse's house in Toontown at Disneyland and use their multi-room technique so you can have two to four (depending on the crowds) Ollivanders performing at once in his wand shop in your upcoming Hollywood Harry Potter land. 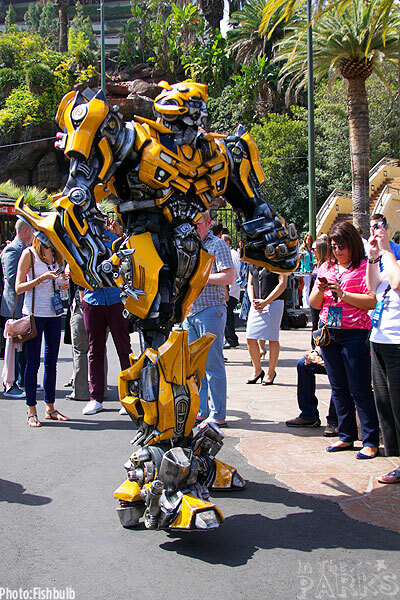 Everyone was boasting the looks of this new Transformer vehicle would rival Carsland's new residents... I know we're missing the wheels but it looks pretty bland to me, not much different from Spidey. "Is that a pinstripping tattoo I see back there?" Granted the concept art looked amazing! 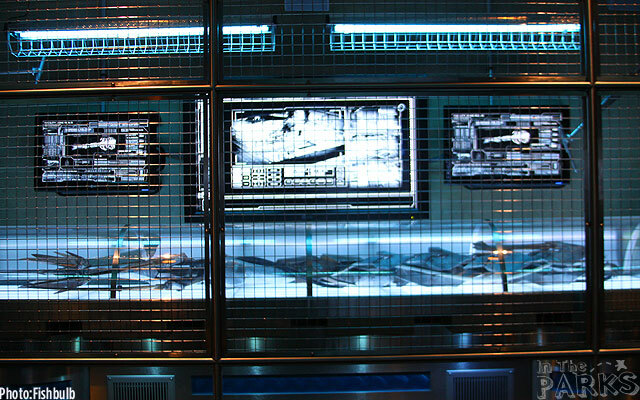 I'm just glad that there are practical effects and real sets along with the 3d screens. It looks like the one in Singapore is mostly screens (at least from what I have seen). Blending in with real sets and effects (a la spiderman) is much preferred imo. Looks awesome! Great pictures Fishbulb and thank you MiceChat! 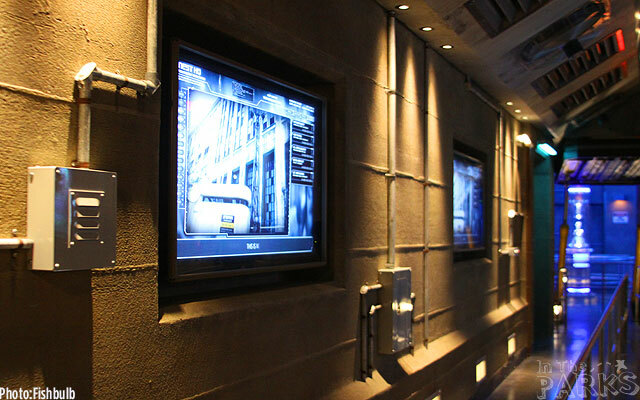 If I love Star Tours 3d. 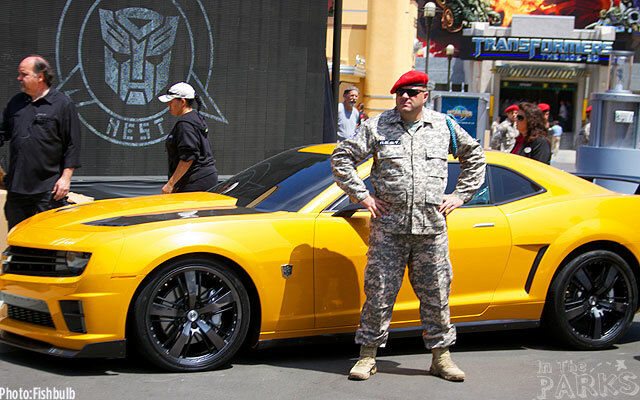 I will LOVE Transformers 3d 10x more. So excited. because I'd be inside and wouldn't have to look at it. Last edited by jcruise86; 04-13-2012, 01:08 PM. Since when? Disney hasn't done anything to match Spider-man. Transformers is another leap ahead. 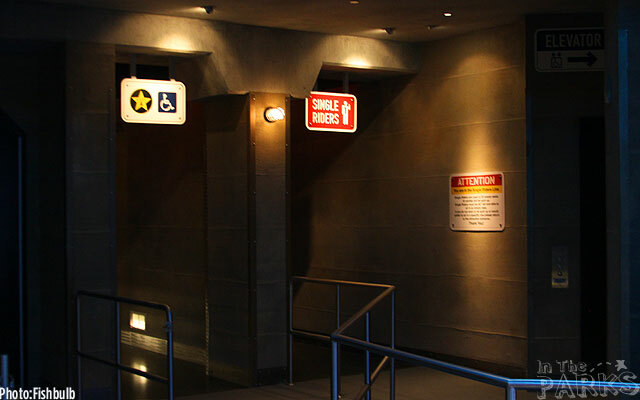 Universal is clearly leading here. Last edited by StevenW; 04-13-2012, 01:55 PM. I was just expecting a beefier flashier version of Spiderman's after seeing such wonderful concept art. No doubt the ride will be phenomenal! 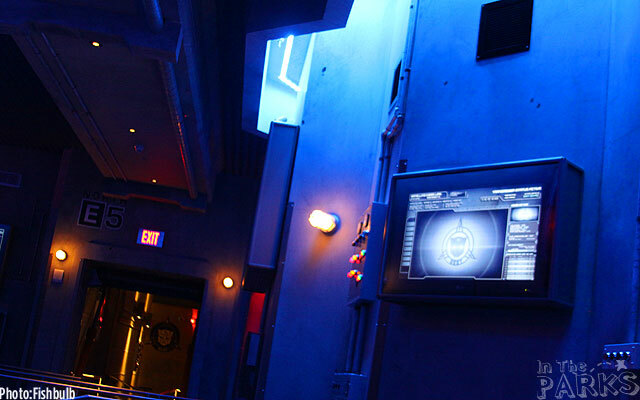 probably similar to spiderman... basically looks like star tours but on a moving platform. It looks very cool but is it really that much better than Spiderman? I don't think it will be. I hope universal does very well this summer so Disney finally realizes that catering to only young children and slowing down their attractions for this purpose (RSR anyone?) is a bad idea! 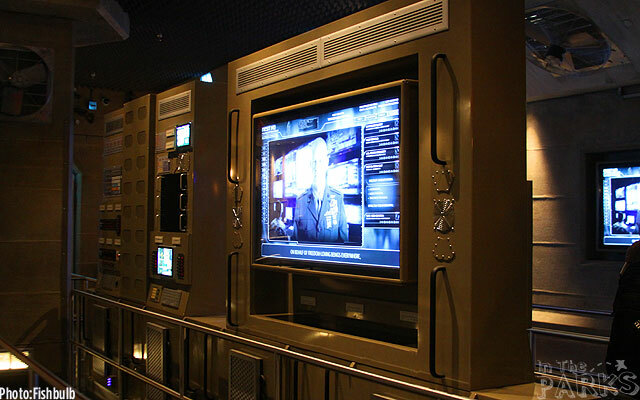 Hopefully WDI gets full rein of Tomorrowland and we get a ride better than anything we've seen since Indi. 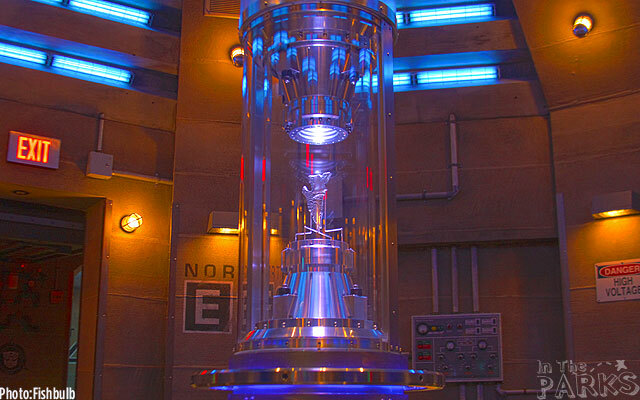 For me personally, Spiderman never beat Indiana Jones (given all its effects are running). 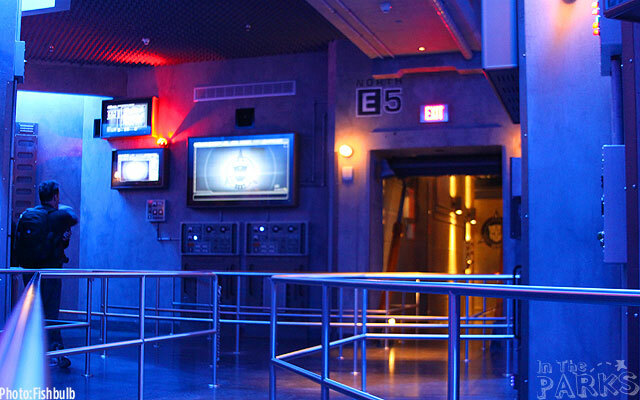 Don't get me wrong, Spiderman is a close second, but something never meshed for me with that ride, and I think it was the fact that the cartoon-based animation never fully merged for me with the real sets (given I haven't been on the ride since they upgraded to HD projection). 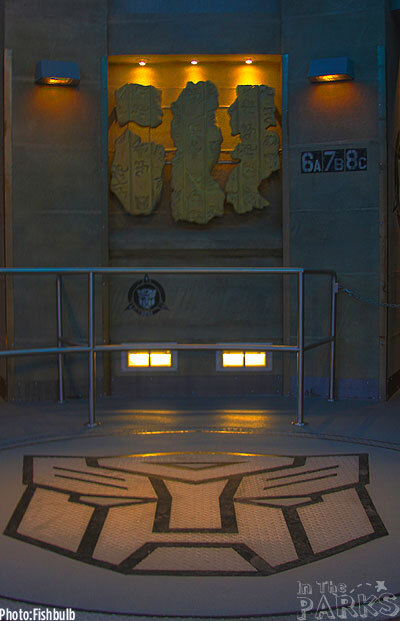 That having been said, the photos in this report coupled together with the fact that the videos here will not be cartoon-based but real-world-based make this attraction look like it will blow Indiana Jones out of the water. 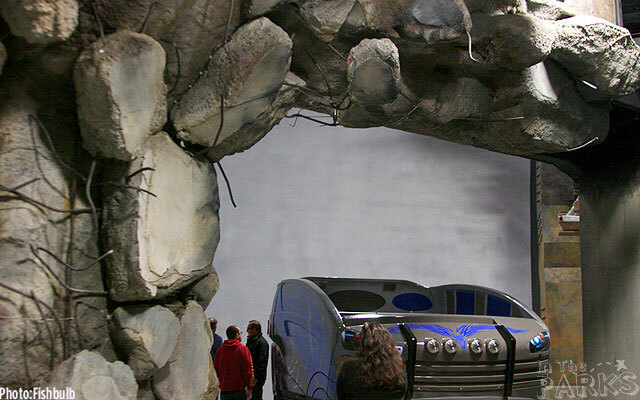 Based on this report I think this attraction will do a better job blending the real and projected sets. Regardless hopefully this pushes Disney to do something new out here, because although the Radiator Springs Racer vehicles are new to SoCal, they hardly have that cutting edge vibe and feel to riders that this attraction will have.